The well-known rugby official will need to do some early morning shopping on Saturday morning. 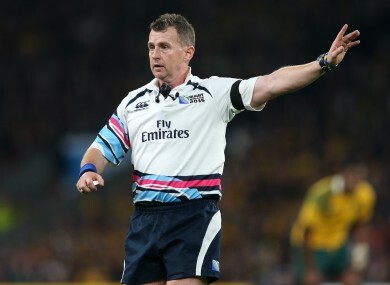 NIGEL OWENS MAY just hear a bit of quick-witted banter at Twickenham tomorrow when England play host to Ireland in their crucial RBS 6 Nations clash. The Welsh official is a touch judge for the game in south west London but his preparations have been dealt a bit of a blow. Earlier this evening, he took to social media to ask a favour of his followers. After getting a tip-off about there being ‘a Sports Direct 2 roundabouts down from Twickenham’, Owens confirmed he’d grab some new boots there. So, if you spot him slipping and sliding along the touchline tomorrow afternoon, you’ll know why. Email “Ahead of tomorrow's crunch game, Nigel Owens hasn't enjoyed the best preparation”. Feedback on “Ahead of tomorrow's crunch game, Nigel Owens hasn't enjoyed the best preparation”.